Retrospective examination of this illustration and the accompanying text makes it clear that the occluding thrombus had formed in the ostial valve of a tributary vein and had subsequently protruded into the femoral vein lumen. 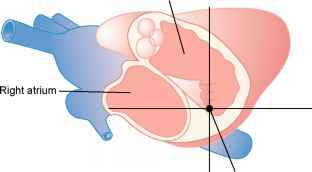 Because ostial valves are unicuspid, a thrombus that forms in such a valve would be expected to occlude the tributary completely, so the tributary and its sub-tributaries will become distended. Thus, we can predict that ostial valve thrombi will usually, or perhaps always, result in varicose veins. More speculatively, we may propose the converse that all or most cases of varicose veins are attributable to (probably silent) ostial thrombi. This speculation is consistent with recent accounts of chronic venous disease (Bergan et al. 2006). This hypothesis, which has been experimentally corroborated (e.g. Hamer et al. 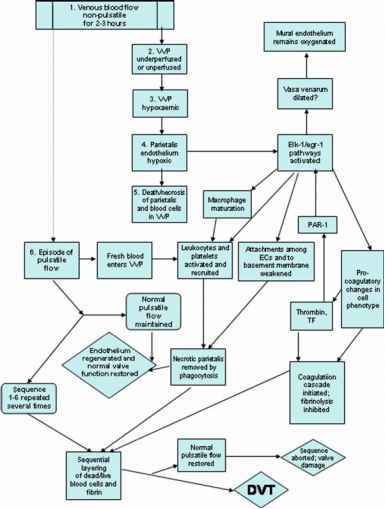 1984), explains the frequency of pulmonary embolism and chronic venous disease. Two of its important premises are (1) that venous thrombi can (and usually do) form in blood that is normally coagulable, both systemically and locally (2) that the blood must be flowing, not static, for thrombi to form (Malone and Agutter 2006). In the years following its publication and experimental corroboration, interest in the phenomenon of ischaemia-reperfusion injury (IRI) flourished, not least because IRI is of great significance in transplant surgery. The underlying mechanism of IRI as it is understood today somewhat resembles that described by our alternative model, though the former relates primarily to the heart and arteries, the latter exclusively to the veins. As advanced ordnance created higher-energy war wounds, as the private sector acquired high-energy weapons, and as vehicles became faster and more pervasive, surgeons have had ample opportunity to apply the lessons of war to the civilian sector. In terms of chronic wounds, people have been living longer and suffering from some of the latter stages of chronic disease. Diabetic foot ulcers were rare prior to the advent of insulin. Paraplegic patients rarely lived for long periods with pressure ulcers, and end-stage venous disease is similarly a latter-day occurrence. Encompassing a wide range of ages and causes of death, he found thrombi in most of the larger leg veins the soleal vein scored particularly highly (see also Sevitt 1973 Sevitt and Gallagher 1961). Thrombi were initiated as microscopic nidi in regions adjacent to the valve cusps, where their main constituents were leukocytes, platelets and fibrin (i.e. they began as 'white thrombi'). The overall composition of a mature thrombus, notably its erythrocyte content, may therefore depend on its age and on the mean local blood velocity during its formation and development but thrombus formation depends on blood movement within and near the VVP, and is initially associated with the local congregation of leukocytes. Volume increases sufficiently to fill the extra capacity. For example, in pregnancy the increased vascular capacity of the uterus, placenta, and other enlarged organs of the woman's body regularly increases the blood volume 15 to 25 per cent. Similarly, in patients who have large varicose veins of the legs, which in rare instances may hold up to an extra liter of blood, the blood volume simply increases to fill the extra vascular capacity. In these cases, salt and water are retained by the kidneys until the total vascular bed is filled enough to raise blood pressure to the level required to balance renal output of fluid with daily intake of fluid. Blood clots in the leg veins, which can dislodge and move to the heart and lungs. Riskfactors Surgery, obesity, cancer, previous episode of DVT, recent childbirth, use of oral contraceptive and hormone replacement therapy, long periods of immobility, for example while travelling, high homocysteine levels in the blood. Site of valve cusp injury just as they do in the circulation (notwithstanding their apparently lower concentrations in the leg veins Woldhuis et al. 1992). 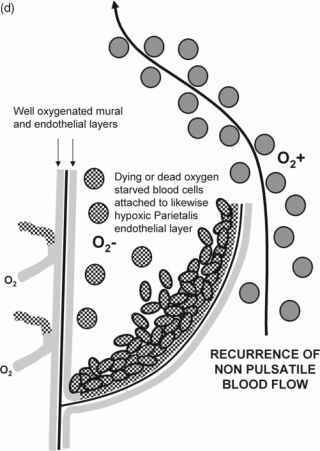 When platelets congregate on the dead parietalis, the coagulation process leading to fibrinogenesis may be initiated (Chapter 2). The resulting fibrin web may then begin to entrap red cells. From this, we may imagine that every 'coagulum' embodies a white red alternation of layers (each only a few microns thick) so that every thrombus is composed of multiple, sequential, strata of white cells with thin backings of red cells a venous thrombus is built up like a coal seam rather than as a 'single clot in a basin'. Herein lies the answer to Aschoff's conundrum and his illustration of thrombus histology venous thrombi have layered, 'coralline', structures because of the way they are formed. McLachlin et al. (1960) provided experimental evidence that 'stagnant blood' (they used the term 'stasis') co-exists alongside moving blood in these particular circumstances. An injected radiographic dye was visualised in what the authors presumed to be VVP of leg veins whenever the 'peripheral venous heart' pulsed less frequently and or less forcefully than normal, i.e. when the 'diastole' of the calf-muscle pump was indefinitely prolonged by postponement of the next muscular 'systole'. This resulted in the sequestering of the tracer in VVP as shown by x-ray photographs, implying underperfusion or non-perfusion of the valve cusps, which fluttered half-open and half-closed (Chapter 9). Virchow's engraving (Fig. 10.1) suggests that different investigative procedures could reveal different proportions of parietal to ostial valve thrombi, and this might explain the extraordinary difference of opinion between Sevitt and Paterson. 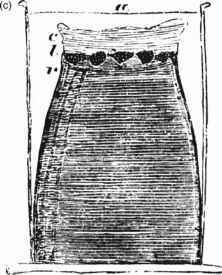 Moreover, as the engraving illustrated, the propensity of thrombi to dehisce and or fracture to release emboli, and the tiny residual lesion barely visible in the tributary mouths, show that a search for the primary site of a fatal embolus could be vain, since it is marked only by the trivial little thrombus in, or poking out of, a femoral vein tributary. Such veins would have to be harvested and dissected very much more thoroughly, perhaps after isolation and glutaraldehyde fixation, if accurate knowledge of the true extent of thrombosis in leg veins and their valve-guarded tributaries were to be sought. Several other points arise from Fig. 10.1. 8 Outside the VVP, neutrophils release proteinases and ROS that alter the ECM of the vein wall. Concomitantly, the endothelium releases mitogens that induce the subendothelial smooth muscle cell to dedifferentiate and proliferate (Michiels et al. 1994). Chronic repetition of these processes can eventually lead to alterations in the venous wall such as the ones observed in varicose veins. Before dealing with wound management, we must always consider the underlying cause of the ulcer and ensure an adequate blood supply (or the correction of an impaired blood supply) to the leg and ulcer area. 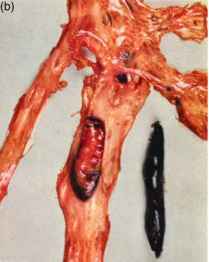 The great majority of ulcers are because of venous disease, arterial disease, or both (16). Studies of arteries and veins in Alexandria during the later centuries BC, notably by two pioneers of vascular surgery, Herophilos and Erasistratos, culminated in the work of Galen during the 2nd century AD. Galen used venesection to treat ulcers and varicose veins. His mainly accurate anatomy, and his mainly fanciful physiology, remained virtually unquestioned until the 16th century we shall say more about this in Chapter 8. In 1452, Leonardo da Vinci produced superb anatomical drawings that included illustrations of superficial limb veins. These were important precedents for the revolution in anatomy that was to take place a century later in the school of Vesalius and his successors in Padua. The best part is you do not have to wait for Get Rid Varicose Veins Naturally to come in the mail, or drive to a store to get it. You can download it to your computer right now for only $19.00.